In the mountains of western North Carolina, an artist creates blown-glass vessels and mixed-media sculptures. In the first room of Rob Levin’s studio, his designs — elongated and pointed, intricate and etched, brilliantly hued — catch the morning sun. In the second and third rooms, ceiling-high stacks of branches and bamboo dominate. In the fourth, shelves hold dozens of pieces awaiting completion. This last room, where Levin watches the seasons change outside, is where the true work gets done, on a decades-old bench surrounded by glass furnaces — plus corrugated tin panels to protect him from the heat his remarkable creations require. 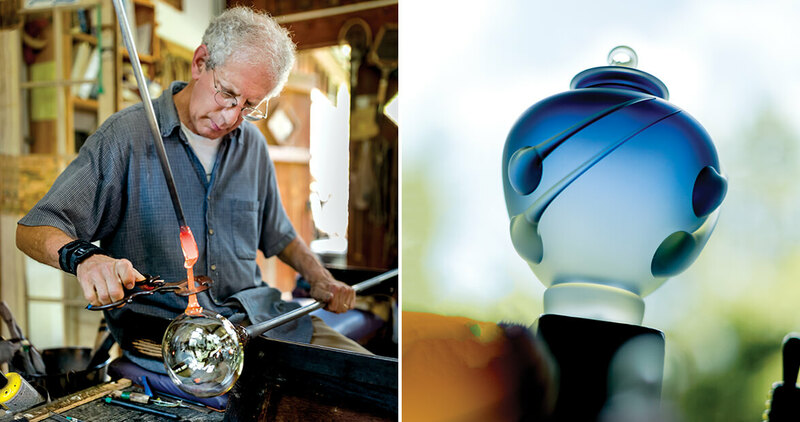 Feature image: To create “ribbons” of glass on a finished piece (above left), Levin adds globules of hot glass while the piece is still in progress.